The last thing you want is for all of the hard work that’s gone into making your household look beautiful to be wasted by damaged ceilings that pull the eye away and make them focus on the cracks or holes that have occurred over the years. 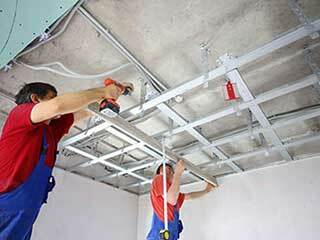 As much as the ceiling drywall is sturdier than that of the walls, they can still be harmed from accidents and aging. Aside from the aesthetically displeasing nature of it, they can also be potentially harmful of pieces begin to fall. Rather than leave it looking shabby, it’s time to get them looking pristine again thanks to our professionals and their high-grade tools and materials. These types of ceilings require careful planning to avoid there being a noticeable distinction between the original drywall and the new patch. Our technicians will first inspect the area to determine how far the damage extends as well as confirm there’s no wiring, pipes, or studs that may pose a problem. The textured paint on the ceiling will all be carefully scraped off so there will be no mismatching of texture patterns before the harmed area of drywall will be sawed and removed. After cutting the new piece to the right measurements, it will be attached by drywall screws and covered with joint compound and specialized tape. Once this has all dried and been primed, we’ll paint using a special textured sleeve to restore the look to your ceiling. Our trained team can easily tend to smooth ceilings that have sustained damage as well! We’ll remove as little of the original drywall as possible to take out the damaged portion before replacing it with a new cut piece of the correct thickness. The joint compound used to keep it in place will be attentively smoothed before it’s all primed and painted. Instead just call Drywall Repair & Remodeling Beverly Hills today and let us come out and get your ceiling’s drywall repaired right away.